On love, loss, and homecomings. Peyton’s coming home. And I am a mess. The heart is a funny thing. It sneaks up on you during the darndest times. You can tell yourself whatever you want in your head. But your heart won’t let you lie. I was fine. I was good. Better than good…I was great. 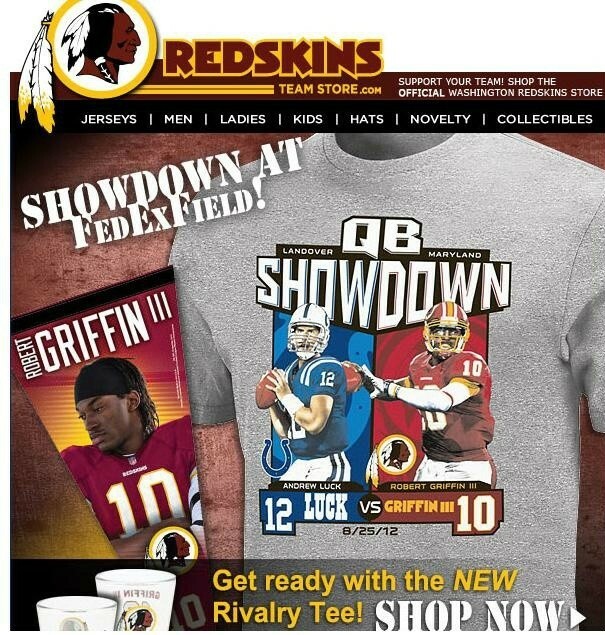 I was watching the Cowboys – Redskins game on Sunday Night Football. I was thinking about how happy I was that my Colts chose Andrew Luck over Robert Griffin III. Here we go. Required viewing. Just like the Mayflower vans when the Colts play the Ravens. We’ll be seeing that clip a lot this week. Every day. Multiple times a day. All week. I’ve seen it so many times, it hardly even bothers me anymore. But what I saw next…I was totally unprepared for. I looked up from my iPad to see Peyton Manning in a Colts jersey. Running onto the field at Lucas Oil Stadium. In slow motion. The words, “I’m coming home…I’m coming home…Tell the world that I’m coming home,” played in the background. It caught me off guard. I couldn’t breathe. Almost instantly, there were tears. Lots of tears. Running down my face. I kind of gasped and sobbed at the same time. You know how you think you’re over someone? And then you see them? And you feel like someone hit you with a big old bag of bricks? Like you’ve been knocked off your feet? That’s what happened to me when I saw the promo for Peyton Manning’s homecoming on Sunday Night Football. I went into a mini tailspin. Which is weird, because I’m over it. I’m so over him. I’ve moved on. I have Andrew Luck. What more could I ask for? I feel like I did in high school. When my old boyfriend came home from college and I was happily dating someone else. It’s weird. Especially when your new boyfriend tells your old boyfriend he’s sick of hearing about him all the time. Yes. That actually happened. I know. But I’m pretty sure it won’t happen this week. That’s not exactly Andrew Luck’s style. All this time, I’ve been thinking about the game. I’ve been thinking about my team. I’ve been thinking about what I’m going to wear. But, I hadn’t yet pictured what would happen when I saw Peyton Manning back on the field at Lucas Oil Stadium. Until Sunday night. It wasn’t pretty. And I’m going to need waterproof mascara. And I may need counseling. This entry was posted in Broncos, Colts and tagged Andrew Luck, Home, Homecoming, Indianapolis, Lucas Oil Stadium, Peyton Manning. Indianapolis Colts rookie Quarterback Andrew Luck wrote the first chapter in the history of his NFL career on Sunday. And he couldn’t have scripted it much better himself. The consensus from coaches, teammates, fans, and the media was that they also couldn’t have written a better start for the Stanford star and this year’s top NFL draft pick. Luck took the field for the Colts first preseason game against the St. Louis Rams in front of a sold out crowd at Lucas Oil Stadium. Sold out? In a preseason game? Do you think Indianapolis fans are looking forward to a fresh start? His first play, a quick toss to Running Back Donald Brown…for a touchdown! Luck also had a beautiful touchdown pass to Austin Collie. And commanded a fantastic drive that resulted in Delone Carter running (or more like jumping) one in for a 21-3 halftime lead. 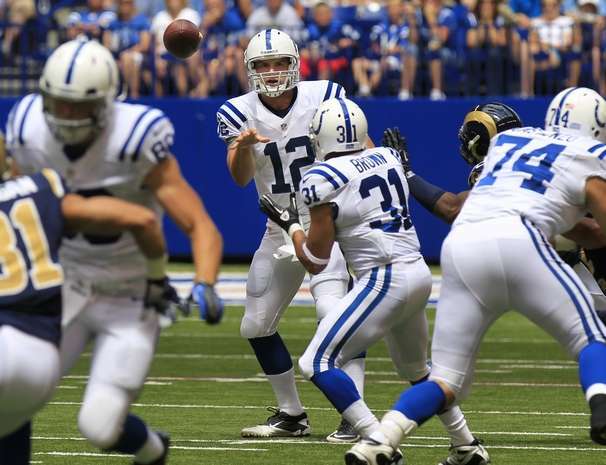 In four possessions, Luck finished the day 10-of-16 for 188 yards and 2 touchdowns. His passer rating was 142.7. The Colts beat the Rams 38-3. The only known cure for a broken heart is falling in love. And Colts fans just fell in love again. This entry was posted in Colts, NFL, Rams and tagged Andrew Luck, Austin Collie, Delone Carter, Donald Brown.